We always wondered how Rothbury Festival would re-emerge and evolve. And earlier this year the Electric Forest Festival was announced with Tiesto, REO Speedwagon, String Cheese Incident and others set to headline. EFF is produced by the same folks who put on Rothbury in 2008 and 2009. And this year, the original grounds of Rothbury were reduced, with the main stages being more centrally located around one of Rothbury’s most visually stunning and engaging hangouts: Sherwood Forest. …Two Coloradans headed to the Electric Forest Festival were arrested after a traffic stop yielded about 11 pounds of hash candy bars they were allegedly going to sell to festival goers this weekend. 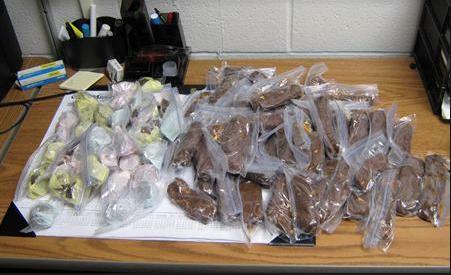 A search found 48 hash bars and 42 hash balls that, the suspects said, they were going to sell for $5 each to concert goers at the Electric Forest Festival. There was also more hash and marijuana the suspects could use to make more at the festival. In the Wood-TV video, the Michigan State Police talk about keeping the peace and protecting concert fans, which they do for the most part. But, as we learned during our Sensual Smackdown with the MSP backstage in 2009, the protecting and piece does come at a price. During the collision I learned that in order to protect one concert fan, another concert fan must be sacrificed. That said, I hope everyone is safe and has a fun time this year at the EFF. And stay tuned as we explore this hash candy and other stories about how drugs influence the live concert experience in our ongoing series of shows on Concert Fan Emotions. Were you at The Electric Forest Festival? Have you been to Rothbury? We invite you to share your concert experiences and thoughts in the comments below, so we can feature them in a future episode of Live Fix Radio.